All paid/registered NSA STL Chapter members and paid guests are invited to attend the morning programs, lunch, and the afternoon programs as well! NSA members who are not STL Chapter members are also welcome to attend with a $47 guest fee. Lunch will be provided. 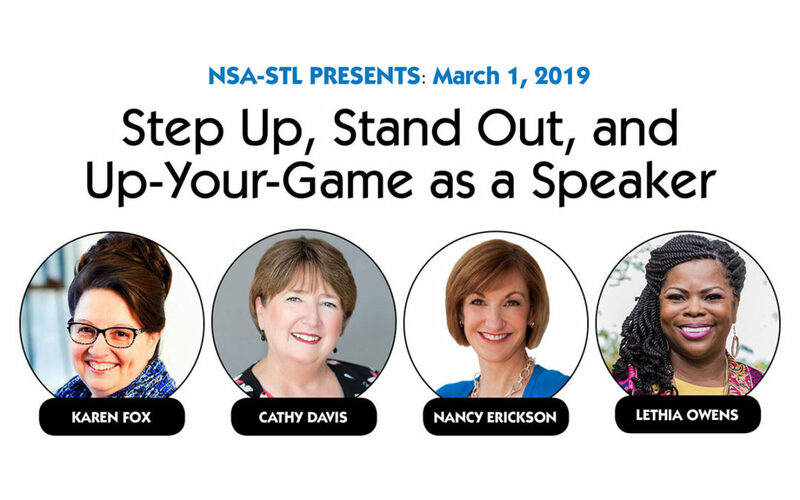 Join us for an informative, lively and fun meeting as four of our own NSA-STL members, Karen Fox, Cathy Davis, Nancy Erickson, and Lethia Owens share their expertise to help you “Up-Your-Game” and grow your business as a speaker. Topics covered will include marketing, networking, publishing, and branding. Registration for this robust 4.5-hour meeting is open to members and guests, and includes lunch. Plan to stay for lunch and experience the “Escape Game.” Led by Lethia Owens, this interactive exercise is a powerful team building opportunity and a great playground for exploring personal branding principles. Have you ever been invited to a networking event and you instantly begin to sweat? This presentation will introduce you to the many personalities of networking and how to respond with positive results. What are your options? What is the best fit for YOU? Cathy shares how to safely navigate the current landscape of publishing and outlines the pros and cons of the various publishing options available. This presentation includes stories and examples of how professionals from around the country have used self-publishing to expand their brand and grow their bottom line. It’s not easy to stand out as a speaker, but when you write a book, you establish yourself as an expert, increase your credibility, and can get more speaking engagements. Nancy Erickson will show you a step-by-step process for writing and publishing your book that will up your game—even if you’re not a polished writer. This talk will share creative strategies for taking your speaking to the next level by using game changing and disruptive strategies to engage your audience and build a stand-out brand. Lethia will share first-hand how she has breathed new life into her speaking business by incorporating unique and fun concepts into her programs. After her presentation, Lethia will facilitate the Escape Game for our chapter followed by a Q&A session to help participants think through ways they can add creative experiences to enhance their speeches. THE ESCAPE GAME: Micro-Learning and gamification are two of the hottest trends in adult learning. Research shows that professionals, and especially millennials, prefer learning experiences that are immersive and allow them to be an active participant. Lethia Owens created an escape game called “Ransomware Lockout” and participants are raving about their experience. The escape game creates a powerful team building opportunity and a great playground for exploring personal branding principles. Participants have the opportunity to explore, in real-time, how they show up and how others perceive them when they reflect on their performance during the game.